March | 2012 | ride.hike.eat. The weather has been super nice for the past few days and emails were flying around from my cycling friends about riding this weekend. I must admit that I was jealous. I have been itching to get on my bike for the past few days. But my bike was not tuned up and I was not sure if any of my cycling clothing still fit me. Nevertheless, I asked Joel if he wanted to go for a ride with me and he said yes. I was super excited! Since I was not sure if any of my cycling clothing fit, I looked through my clothes and I picked a few shorts and jerseys. I am sad to say that my shorts no longer fit me. They are tight around the waist, which is no good for the baby. Luckily for me, Joel had a couple of cycling bibs, which he suggested that I try on. I was so excited that they actually fit me! Even better was the bib part, since it extended up my belly and provided belly support. Next up were the jerseys. I was pretty surprised that three jerseys actually fit me really well. Joel also suggested that I try on a few of his jerseys, which also fit really well. I am now set for riding as much as I can! Wahoo!! We decided to ride around Mendon Ponds Park area, since it is not as hilly as our neighborhood. I must admit that I was a bit nervous about riding. I was not sure if it would feel ok. It was perfect!! I felt really great! It felt as though I did not stop riding for the winter. I am so excited that I felt so great! I love riding so much, I was a little sad about the possibility of not being able to ride this summer. We rode for a little over an hour, which was plenty. I did get a little tired towards the end. The rolling hills were not too friendly as usual. But I guess that’s how it is for the first ride of the season. Also, as I was pedaling, I could feel my legs touching my belly a little. 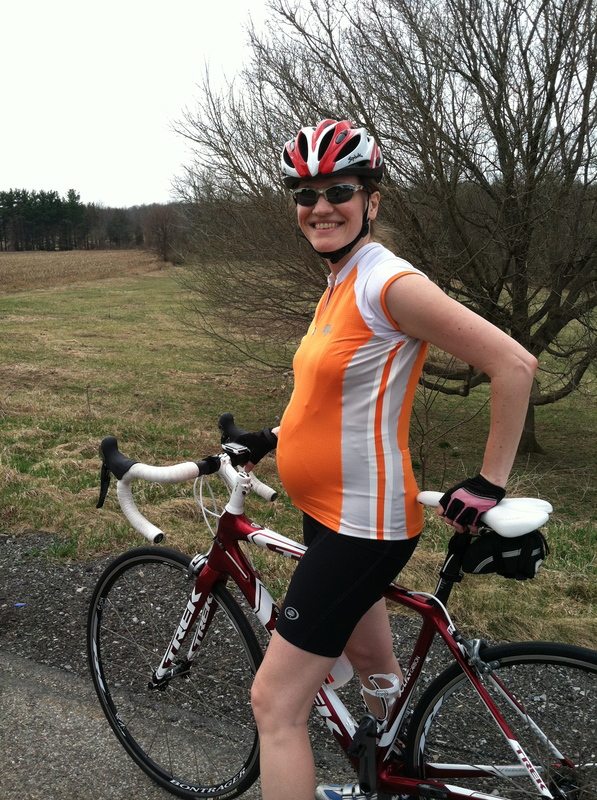 It was not a big deal, but I can foresee a bike change (my old bike) as my belly gets bigger. One caveat about being pregnant is that the bladder is not in a very good spot. I had to pee for the last 15 minutes of the ride. Next time I will have to find a public restroom or a port-a-potty during the ride. HA! Our stats were: 1 hour and 15 minutes, 17 miles, and 13.4 average.